The twelfth Express Entry draw seeking permanent residency candidates in 2018 was held on June 13, 2018. 3,750 candidates will receive an I.T.A., and this makes the present Canada Express Entry draw the largest in this year. The C.R.S. cut-off threshold for was 451 points. Like the recent draws, there was a tie-break mechanism in it. Owing to many candidates having 451 C.R.S. points, those who had a profile in the pool for a longer period receive the priority. Eligible candidates who created their profile prior to July 21, 2017 at 07:01:28 UTC receive the invitation in this draw. In this draw all candidates spread across all programs under the Express Entry, like the F.S.W. Class and the Canadian Experience Class received the invitation. The government released its Canada Immigration Plan for 2018-2020 On November 1, 2017. It shows the commitment of the country to increase the numbers which will arrive by using the F.S.W. Class, C.E.C.and F.S.T. Class to nearly 250,000 during the next three years. 184,000 fresh permanent residents will settle in the country by using the Provincial Nominee Program before 2020. There is a possibility of issuing more invitations in the approaching weeks, months, as well as years. This will benefit individuals and families across the world who wish to make Canada their place of permanent residence. The CRS has the maximum 1,200 points and it is used as a benchmark to rank the applicants in federal economic programs. It is an essential part of the Express Entry, which began in January 2015 for processing residency applications. This score is used as a cut-off point in the draws. It has a design which projects the chances of a candidate to become economically successful in Canada. The entry norms of the pool are that the candidates must qualify under the Federal Skilled Trades Class, the Federal Skilled Worker Class, or the Canadian Experience Class. Candidates who obtain a provincial nomination by using a Canada Provincial Nominee Program stream which is in alignment with the Express Entry get 600 extra C.R.S. points and also an I.T.A. in a later draw from the pool. A single candidate earns a maximum of 260 points for proficiency in English or French. Furthermore in case of couples they earn a maximum of 270 points. 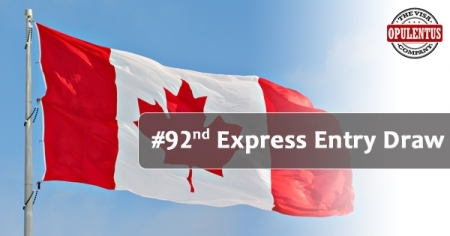 The present draw is the 92nd since the Express Entry system started its operations.